Interpolation is the computer-generated motion between two keyframes. Some animators and compositors like to create their own in-betweens, while others like to have the computer do it. Harmony has stop-motion (no interpolation) and motion keyframes (computer-generated interpolation). In stop-motion keyframes, there is no computer-generated motion between two keyframes. The segment is constant or flat. The drawing remains still until the playback reaches the next keyframe, then the drawing pops to its new location. 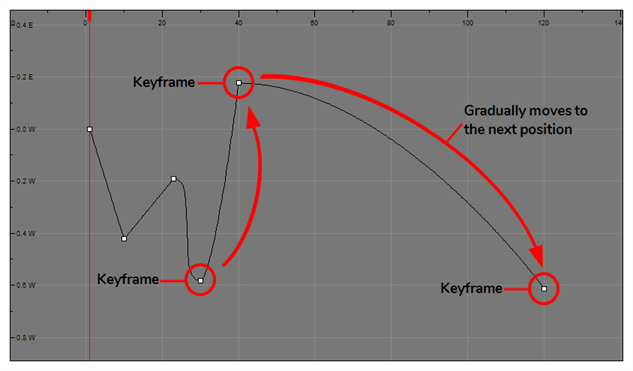 With motion keyframes, Harmony generates the interpolation between the keyframes. 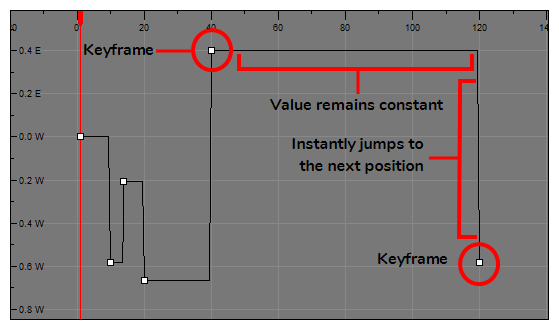 This means that a value for each frame between the keyframes is calculated by Harmony to progress from the value of the previous keyframe to the value of the next keyframe.